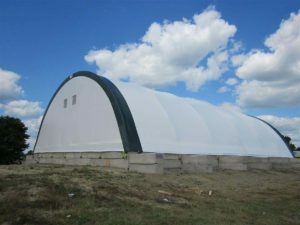 The Arlington County Board today voted to allow the County to build an interim salt storage structure before winter sets in, on County-owned property on Old Dominion Drive, between 25th Road N. and 26th Street N.
The Board unanimously approved a rezoning of three parcels, a re-subdivision of four parcels, and parcel consolidation on the site. The parcels were rezoned to P-S Public Service District to allow by-right construction of the temporary salt facility. The Board’s action followed the County Building Official determining in Spring 2018 that the heavily rusted metal salt storage structure was unsafe for operations after ore than a half-century of service. The County needs to build an interim structure before winter to hold salt used to treat County streets in snow and ice storms, and to ensure the efficient operation of County snow removal operations. The current salt storage structure, together with the former adjacent salt pile on the Old Dominion site, held 60 percent of the County’s stockpiled salt. By operating the north Arlington facility with a second facility at the County’s Trade Center in south Arlington, the County minimizes travel time for snow removal operations. Loss of the site’s storage and loading capacity would severely degrade the County’s snow removal operations. The County expects to use the interim structure at the Old Dominion site for three to four years, while the future of the entire site is planned and a permanent facility is built. 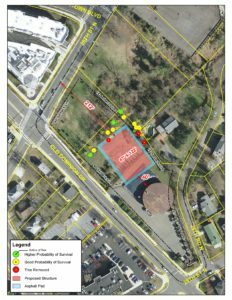 In a separate action, the Board voted unanimously to adopt a charge for a master planning effort for the entire 7.6-acre Old Dominion site. The Board plans to appoint a Master Plan Task Force in October, to include representatives from the four neighboring civic associations; Marymount University; St. Mary’s Episcopal Church; the County’s Joint Facilities Advisory, Park and Recreation, Planning, Transportation, Urban Forestry and Environment and Energy Conservation commissions and the Public Facilities Review Committee. Since July, the County’s Department of Environmental Services has communicated with the four adjacent civic associations on the need to replace the existing salt storage facility, and consulted on the placement of the facility. The department held two on-site walking tours, made significant changes to the layout to minimize tree removal, pruned roots to maximize the chance of preserving even more trees, and consulted with the community on the canvas color of the interim structure. The Board’s adoption of a charge for a master planning process for the site sets the stage for a community planning process that will begin before the end of this year. Under the charge, the master plan will provide for winter storm response services to north Arlington, including a salt storage capacity of 6,000 tons and support facilities to dispatch crews, consisting of a staff dispatch and monitoring area, crew break and rest rooms and staff parking. It also will include areas for mulch distribution, leaf operations and storage; open space and other possible compatible uses. 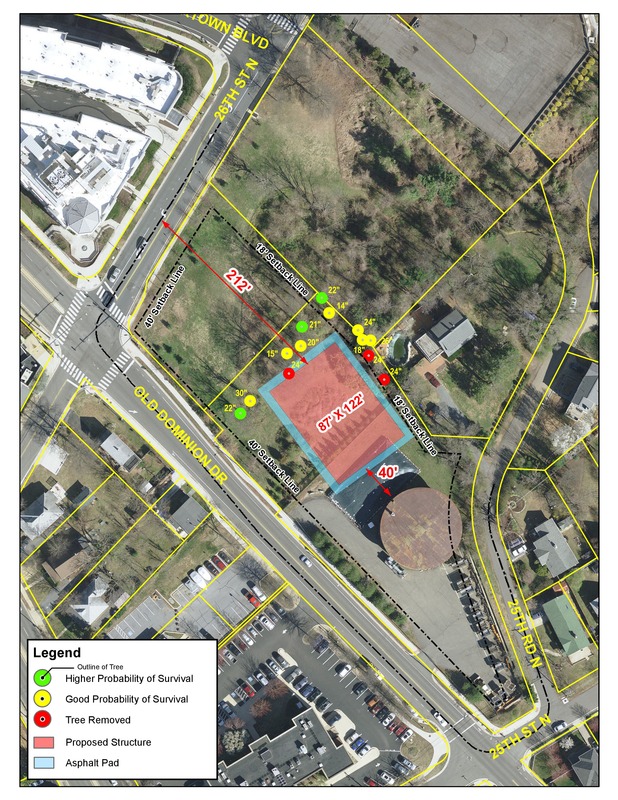 Other possible public facility, operational and/or other uses will be evaluated, along with locations for appropriate visual, light, or noise screening or buffer treatments to mitigate the impact of on-site activities on the neighborhood. The master plan could include recommended changes to the General Land Use Plan and/or zoning classification of the site. The Master Plan Task Force will begin its work before the end of this year, and will submit a final report to the County Manager before the end of the second quarter of 2019. The group will hold public meetings, workshops, open houses and walking tours, among other outreach efforts to the community. To read the staff reports, visit the County website. Scroll to Items No. 59 (Rezoning, Resubdivision), and No. 60 (Charge for Master Plan Task Force), on the agenda for the September Regular County Board Meeting. To learn more about the County’s salt storage facility plans at the Old Dominion site, and to subscribe to updates on the project, visit the County website. Under the state's expanded Medicaid program, thousands more Arlingtonians will qualify for healthcare coverage.